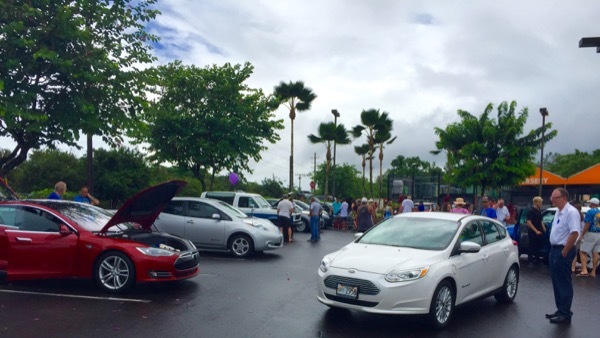 Overall, our Hilo event was a success - we had about 150 guests and many had genuine interest in EV ownership. Despite the decent weather at the start of the day, warm Hilo rain periodically interrupted our event. Owners and guests took it all in stride – we improvised and persevered, despite the weather. We had several models represented: 9 Nissan LEAFs, 5 Tesla Model S, 2 Chevy Volts, a Mitsubishi i-MiEV, a Ford Focus Electric, a BMW i3, a Kia Soul EV, and a Bronco conversion. Senator Russell Ruderman, Representative Joy San Buenaventura, and a representative from Senator Brian Schatz’s office were guest speakers. Sen. Ruderman and Rep. San Buenaventura gave inspiring speeches. Marlena Castro Dixon read Sen. Schatz’s letter of recognition acknowledging NDEW and our group’s efforts to expand adoption of sustainable transportation. Nissan and Kia representatives joined the event. This event will offer the opportunity to learn about EVs from actual owners. You'll hear about the benefits of EV ownership, get to see the latest EVs, and even experience the smooth and quiet rides that can only be had in these next-generation vehicles. This event is made possible by The Home Depot in Hilo - it will be held in parking lot fronting the Garden Center. Registered attendees report 117,000 electric miles driven.